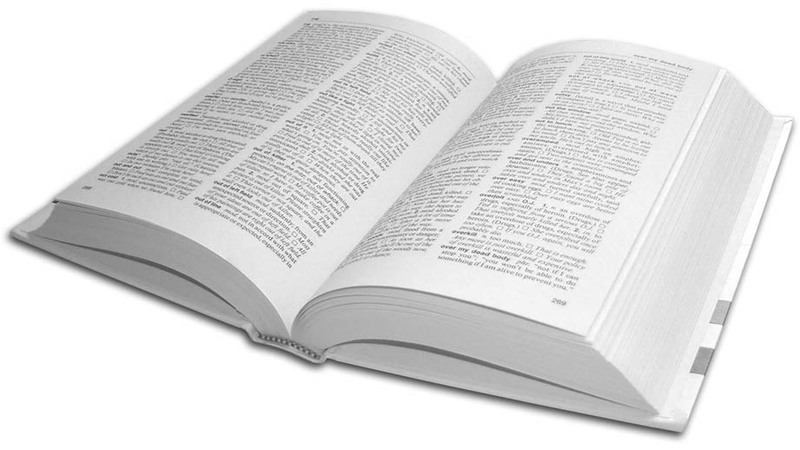 Many of the words used in the search process may be unfamiliar to you or confusing. Here’s a list that will help you navigate the search process. Audiobook: A recording of a book being read. Most audiobooks available to you are provided by the Maine State Library through the 3M Cloud Library. Book: A physical book, held on the shelves of the library. E-Book: A digital text that can be accessed through the internet. These come with varying restrictions. Some can be accessed by multiple people simultaneously, others can only be read by one person at a time, and some can be downloaded or have portions downloaded directly to your device. E-serial: A journal or magazine that is produced on a regular basis by an organization, and is held in digital form through the library’s online resources. Gov Doc (Government Document): A document produced by the United States Government. The University of Maine’s Fogler Library is a respository for all documents produced by the US Government. These may be physical copies or digital copies. Microform: A reduced-size image of a text or document. These can be in the form of microfilm or microfiche, and can be accessed at the library by using a reader. Score: The written musical notation for a piece of music. Serial: A journal or magazine that is produced on a regular basis by an organization. Sound: An audio recording. These may be accessible through the library’s online resources or in a physical copy. There are both musical and nonmusical sound recordings. Streaming Video: A video recording that can be accessed through an internet connection. These cannot be downloaded to your device. Video Recording: A physical copy of a video recording, such as a DVD. These terms are from the URSUS Help page. Available: Item is available in stacks for check-out. Claimed Ret'd: Item is not in the stacks. Last borrower claimed returned. Library staff search before declaring lost. Missing: Item is not in the stacks or checked out. Library staff search before declaring lost. On Search: Item is not in the stacks or checked out. Library staff search before declaring lost. In Repair: Item is being mended. At Bindery: Item is at the bindery. Libr Use Only: Item may not be checked out. Billed: Item is overdue, patron has been billed for replacement. In Transit: Item is enroute to owning library. Lost: Item declared lost; under consideration for replacement. On Order: Item is on order. Storage: Check with a librarian. Paid: Patron has paid the item replacement charges. In Tech Services: Item is in technical services. Ask a librarian for help. On Display: Item is being used in library exhibit. In House Only: Item may not be checked out. Ask Librarian: Check with a librarian for further assistance. On HoldShelf: Item is on hold for another patron at circulation desk. Due [date]: Item is checked out and due back on date indicated. Ask Ref B/W: Item is bound with another item. Reference librarian can check call number under which item may be located. Online: Item is available from an Internet link when using URSUS via a web browser. Onsearch (IN): Item has been determined missing during inventory. Request from another URSUS library if available, or via Interlibrary Loan. 1 Hold: Item has been requested and will be held for the patron when it is either returned or found. Ask Mus of Art: Ask librarian at the Umaine Museum of Art for assistance. 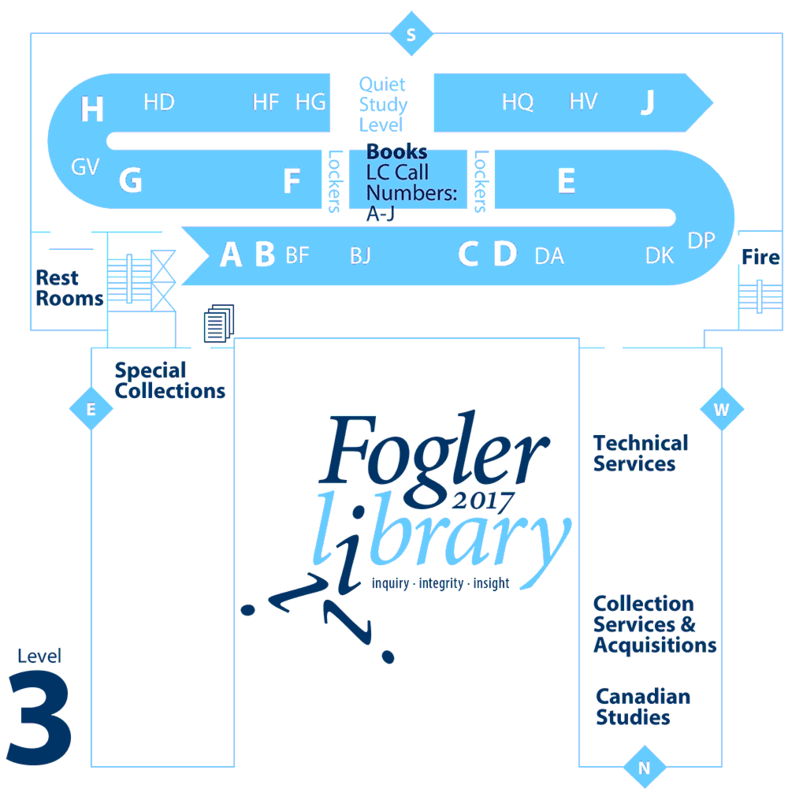 To view these locations on a map, check out the Fogler Library floor maps. Electronic Resource: These items are available online. You can access them without logging in if you are on campus, or can use your UMaine login credentials off campus. 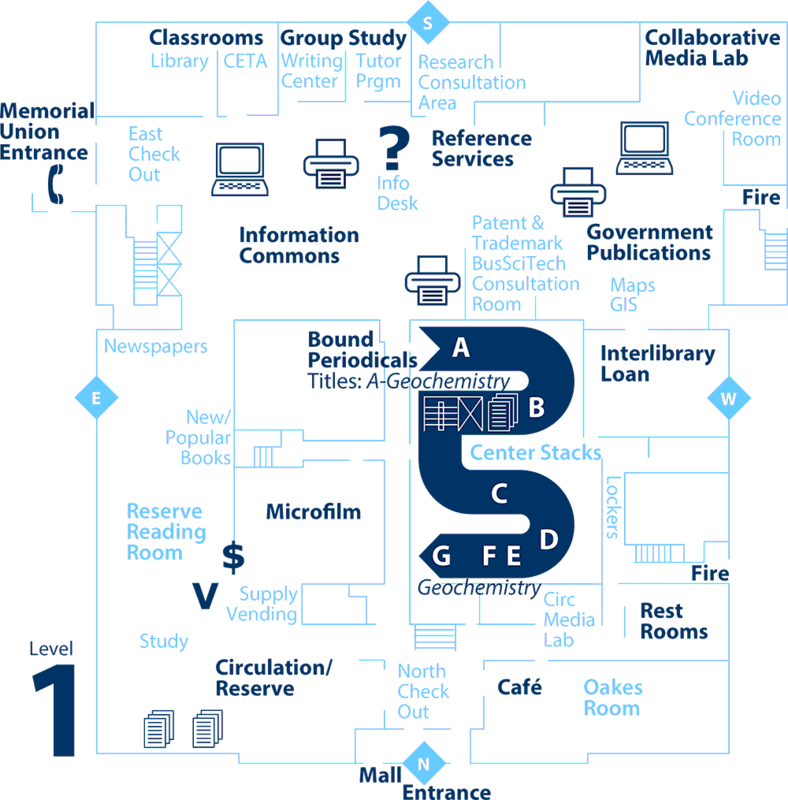 Government Documents: Physical copies of government documents are held in the Information Commons on the first floor of the library. Visit the Reference Librarian to request access. Learning Materials Collection: These items are for children or associated with the teaching of children, and are held on the second floor of the library in the Stodder Room. Library Annex: The book is available, but is at an off-site storage location. To access the book, bring the call number and title to the Reserve Desk, and ask for assistance. Microfilm: Microform items are held in the Microfilm room, next to the Reserve Reading Room. Periodical Stacks: This item is held in the stacks for periodicals, rather than the stacks for books. 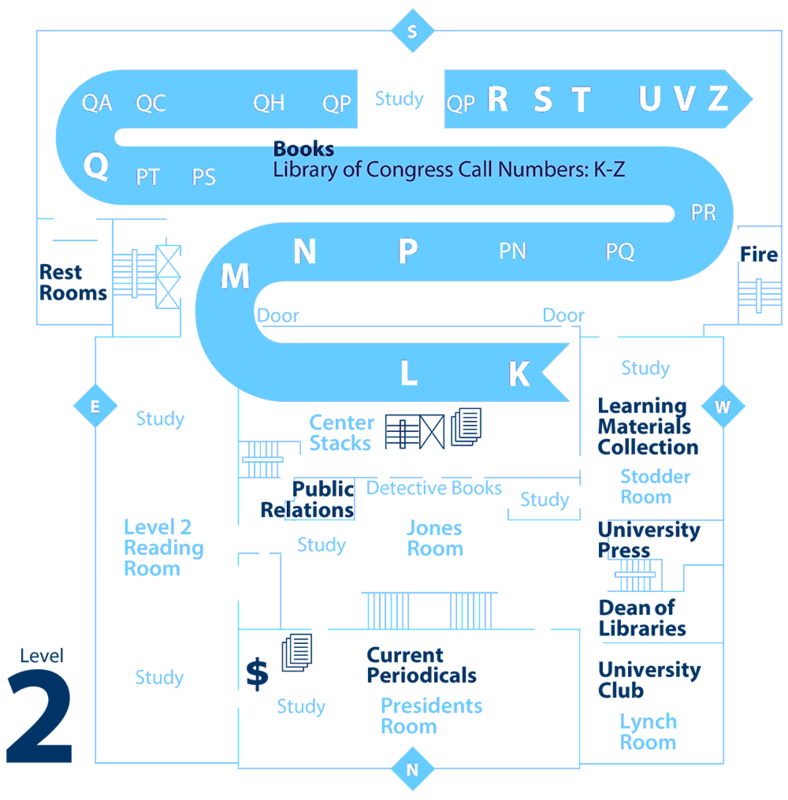 This is located on levels 1 and 1b at the center of the library building. Presidents Room: The Presidents Room, located on the second floor of the library, holds recent issues of periodicals that have not yet been stored in the Periodical Stacks. Special Collections: The book is available for use in the library’s special collections department, located on the third floor. Some of these items may be available for library use only, and others can be checked out. Stacks: The book is available and on the shelf at the library. You can find it by using the call number and finding it on the shelf, and can then check it out with your Maine Card.